If you can’t beat them, deplete them. After over 20 years of uninterrupted rule in its model state, Gujarat, the BJP is still foraging for rival’s crumbs to fill its overloaded basket. And so it was that on July 14, it inducted Mahendrasinh Vaghela, former Congress legislator and son of the eternal rebel, Shankersinh Vaghela into their party. 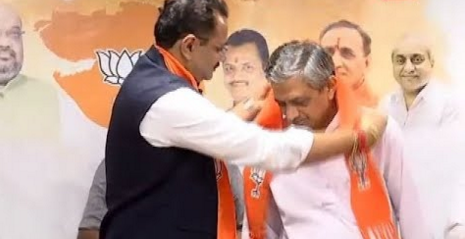 Earlier on July 3, Kunvarji Bavalia a senior Congress leader had switched to the BJP, and was gifted a full- fledged cabinet ministership in the Gujarat government the same day. Mahendrasinh had been elected to the Gujarat Assembly in 2012 on a Congress ticket from Bayad constituency in Central Gujarat, but had quit the party along with father Shankersinh and 13 other legislators before the Rajya Sabha elections in which Ahmed Patel won narrowly. Mahendrasinh was expected to join the BJP before the 2017 Gujarat Assembly elections. He neither did so nor contested the elections though his father created a political outfit, Jan Vikalp Morcha, which contested 105 seats and failed to win a single one in the 182-member House. Incidentally, Bavalia, a four-time MLA, who was elected to the Lok Sabha from Rajkot in 2009, and was inducted into the Gujarat government right away, had a running duel with another Congress leader, Indranil Rajyaguru, who had announced his resignation from the Congress days earlier. Both were unhappy that the Congress’ national leadership was ignoring them. The fact is that the creditable showing of the Congress in the 2017 Gujarat Assembly elections had made Rahul Gandhi realize that the party had accumulated a lot of deadwood and needed a drastic overhaul. With almost the entire Congress leadership decimated in the polls, the process began in earnest. A new state unit chief (Amit Chavda) and a new leader of the Congress Opposition (Paresh Dhanani), both in forties, were inducted. This has ruffled elderly feathers, providing fertile ground for BJP poaching. “It is collateral damage which we are prepared for, to make the outfit fighting fit for the 2019 Lok Sabha elections”, says a top party leader. The grab-and run-game, initiated by the ruling BJP owes its genesis to the impending 2019 Lok Sabha elections and the mounting insecurity of the ruling outfit after the opposition Congress gave it a scare in the 2017 state Assembly elections. The BJP had bagged all the 26 Lok Sabha seats in the state in the 2014 general elections, a feat they are in no position to repeat next year. The poaching is aimed to weaken the Congress more than improving it’s own standing. But this approach is fraught with it’s own dangers. No sooner did Bavalia switch to the BJP that Bhola Gohil, former Congress MLA from Jasdan, who had cross-voted in favour of the BJP in the 2017 Rajya Sabha elections, re-joined the Congress. 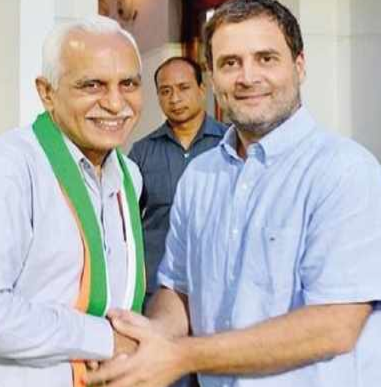 Earlier this week, former BJP MLA-turned-AAP leader Kanu Kalsaria joined the Congress in the presence of Rahul Gandhi in Delhi. Kalsaria, a doctor- politician with a clean image, acquired a name for himself when he led a successful agitation against corporate giant Nirma, which was allotted large chunks of wetland by chief minister Narendra Modi in Gujarat for a project. Another Congress leader to resign from the Congress was Indranil Rajyaguru, who had contested against the chief minister Vijay Rupani from Rajkot and lost. Indranil, however, made it clear that he would not join the BJP. Bavalia’s departure will ensure Indranil stays put. Incidentally, Bavalia’s last kisan sammelan before he joined the BJP on June 24 had flopped. This is indicative that the party’s strategy to create an alternative koli (an OBC caste) community power centre may not work. It already has a koli face in the cabinet, Purshottam Solanki, who has been sulking at not being given a prominent ministry and the induction of Bavalia is meant to undercut him. The 2017 Rajya Sabha elections in Gujarat, Amit Shah is known to have conspired to defeat Congress leader Ahmed Patel. He masterminded the defection of 14 Congress legislators to set the tone for the Assembly elections that were following. Eleven of these joined the BJP, seven of them were given BJP tickets, five of them lost. Similarly, Bavalia was not the lone case. He was only following in the footsteps of Balwant Rajput, one-time chief whip of the Gujarat Congress, who defected to the BJP and was immediately offered a Rajya Sabha seat in a bid to defeat Ahmed Patel. Rajput lost in a poll that hogged headlines and was subsequently appeased with the chairmanship of a state undertaking. To sum it all, Shah’s bravado backfired and in the Assembly polls that followed , the Congress was a net gainer of 21 seats in 2017 against the 57 it had won in 2012. Against this backdrop, there is now considerable resentment within the BJP rank and file at this ‘parachute’ politics being practiced by the Modi-Shah combine at the cost of loyal cadres but quietude remains the better part of bravado as the two rule unchallenged. Meanwhile, the plight of Congress leaders, who left to join the BJP is best typified by former Congress deputy chief minister Narhari Amin. The man who once thundered in the Congress could not even manage a State Assembly ticket for himself in the BJP in 2017 and was reduced to a door-to-door campaigner for others. For that matter, the BJP itself has come a long way from being a party with a difference to one increasingly top driven and a receptacle for Congressmen -- bent, bought or bullied! Any party poaching from rival parties should discriminate between value addition or liability. You don't need Chanakya to understand this.